JARS v47n2 - Does Winter Leaf Curling Confer Cold Stress Tolerance in Rhododendron? Does Winter Leaf Curling Confer Cold Stress Tolerance in Rhododendron? Winter leaf movements of Rhododendron species are classified as thermotropic because the cue for rapid movement is leaf temperature. The physiological and ecological significance of these movements to Rhododendron species differ from the importance of other leaf movements to other species. Changing leaf angle in Rhododendron may serve to protect the leaves from damage during the winter. Winter damage is thought to be due to high light hitting the leaves when they are cold. The significance of leaf curling to Rhododendron plants was studied in this project. Leaf curling intensity was related to cold stress tolerance in a set of 32 species. When studying five species in detail, leaf curling was associated with succulent leaf characteristics. It may be that leaf curling requires a succulent type of leaf and this leaf characteristic limits water stress tolerance in Rhododendron . Under these conditions there would be a trade off between cold tolerance by leaf curling and water stress tolerance. The relationship between leaf curling and cold tolerance was obscured when 75 hybrids were evaluated. Mixing genotypes in hybrids may reduce the effectiveness of leaf curling for cold stress tolerance. Further work needs to be done on the definition of cold hardiness in Rhododendron and the physiological cause of leaf curling. Rhododendron breeders need to know the physiological mechanism behind cold, heat, or water stress tolerance in order to improve hardiness in hybrids. Leaf movements in plants has been a favorite topic of botanists for two hundred years. One of the first classic works on leaf movements was Darwin's "The Power of Movement in Plants" (1881). However, the first publication which mentioned leaf movements was De Martin (1792) who referred to the rhythmic movements in plant leaves. Research on rhododendron leaf movement began at the turn of the century when Hershburger (1898) studied leaf curling in Rhododendron maximum . Generally, leaves can move in a daily rhythm (for example, sleep movements) or in response to specific stimuli. The stimuli which elicit leaf movements are diverse and include: light (of various wavelengths), temperature (both cold and hot), and water stress. Leaves move in aspect (compass direction), angle (orientation to the ground), and by curling. Although much is known about the physiological mechanisms and ecological significance of leaf movements in response to light, heat, and water stress, very little is known about leaf movements in response to cold. Commonly the significance of leaf movements relates to light and temperature tolerance of leaves. Leaves will move in order to increase light absorption and leaf temperature in cold environments, or decrease light absorption to decrease leaf temperature in hot environments. The intensity of leaf movement and its significance to plant performance depends upon the physiological tolerance of the plant and the nature of the environment. Winter leaf movements of plants in the family Ericaceae, such as Rhododendron , are unique when compared to thermotropic leaf movements in other species. This is because Rhododendron leaf movements occur during freezing temperatures and at low light intensity (including the dark) while other thermotropic leaf movements respond to high temperature and high light. It was the unique nature of leaf movements in Rhododendron that stimulated our interest in the ecology of Rhododendron species. 1. There are two physiologically distinct leaf movements: leaf curling, and changing leaf angle (Nilsen, 1985). 2. Movement of leaf angle is primarily stimulated by water stress and secondarily stimulated by high light and low temperature (Nilsen, 1985). 3. Winter leaf curling is only stimulated by temperature, but summer leaf curling is stimulated by water stress (Nilsen, 1987). 4. Leaf curling occurs at a narrow range of temperature (the critical temperature of leaf curling),which is above the leaf freezing point (Nilsen, 1987). 5. 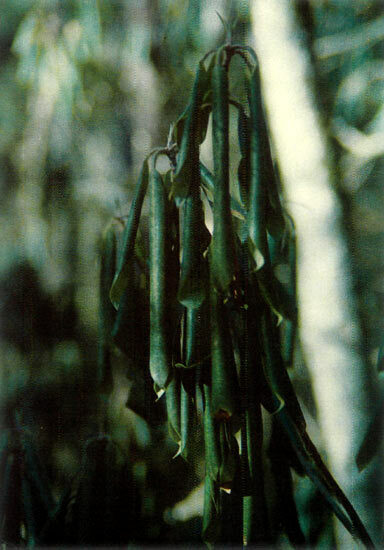 The critical temperature required to induce leaf curling varies among species (Nilsen, 1987). 6. The primary eco-physiological significance for changing leaf angle is to protect the photosynthetic apparatus from damage by high light under cold temperature (Bao and Nilsen, 1988; Nilsen etal., 1988). 7. The most likely significance of winter leaf curling is to reduce the rate of re-warming following leaf freezing (Nilsen, 1990). 8. The patterns of winter leaf movements vary among different species (Nilsen, 1991). The ARS Research Foundation funded the construction of an experimental garden at Virginia Polytechnic Institute and State University in 1987. The garden was constructed and populated with 10 species of Rhododendron . Individual plants were either directly transplanted from field populations or generated from seed derived from the Rhododendron Species Foundation seed lots. The purpose of research at the experimental garden is to determine physiological mechanisms behind hardiness to water or cold stress in Rhododendron species. Therefore, species of known cold hardiness or cold sensitivities were included in the plantings. Since the garden was constructed, several studies related to stress tolerance and physiology have been accomplished. The study we report here is one that compares cold hardiness to leaf movement behavior and water relations in five species. Leaf movements were measured by determining the leaf angle with a clinometer, and measuring the percentage curling (% curling = [1-(leaf diameter / maximum leaf diameter)]*100). The leaf movement indices were compared to simultaneous measurements of leaf temperature and light intensity. Cold hardiness was determined by measuring the percentage of shoot meristems and leaves that died directly due to cold periods in the winter. Leaf water relations were determined by the pressure-volume curve technique (Tyree and Hammel, 1972). Several leaf water relations indices, derived from the pressure volume curves, are used as indicators of potential water stress tolerance. The species included in the study of cold hardiness were: R. arboreum (ARB), R. catawbiense (CAT), R. lutescens (LUT), R. macrophyllum (MAC), R. maximum (MAX), R. minus (MIN), R. ponticum (PON), and R. yunnanense (YUN). 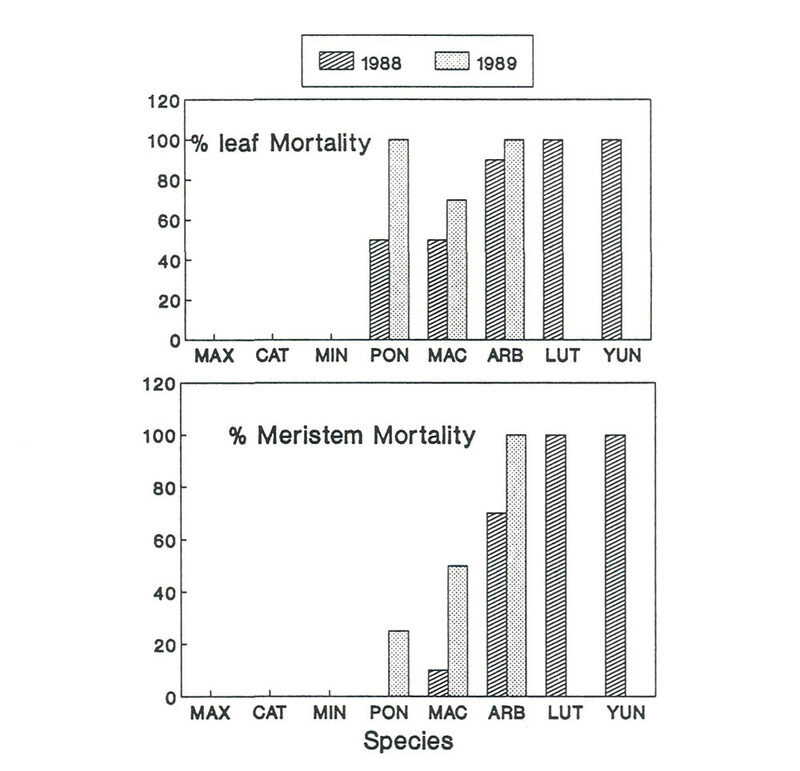 Leaf and meristem mortality was severe for ARB, LUT, and YUN (Figure 1.). All three of these species were completely dead by the end of the second winter. Intermediate hardiness was found in MAC and PON; however both of these species suffered considerable meristem and leaf damage each year. Three species, CAT, MAX, MIN, never suffered any cold induced leaf or meristem damage. Studies of leaf movements and water stress tolerance could only be done on the five relatively cold tolerant species. However, during the time when leaves were present on the cold sensitive species no leaf curling was observed. The winter hardiness data ranked the species in the following order of increasing winter leaf hardiness: MAX, CAT, MIN, MAC, PON, ARB, LUT, YUN. The five species that could be used for studies of leaf curling (MAX, CAT, MIN, MAC, PON) represented a continuum of leaf curling intensities. The two species with the most intense leaf curling were CAT and MAX (Figure 2). Both of these species curled to a 80% or greater leaf curling percentage at -6°C. Intermediate curling intensities were found in MAC and MIN with little to no leaf curling for PON leaves. There was also a difference between leaf angle movement among the five species. The species with the most change in leaf angle were MAX and CAT. Note that CAT has the most intense leaf curling but MAX has the most intense leaf angle change. The leaf angle of MIN did not become vertical until leaf temperatures below -6°C. There was no change in leaf angle for PON and MAC. These studies showed that there was a gradient of leaf movement intensity among the five species. Two species (MAX and CAT)had intense leaf curling and intense changes in leaf angle. One species had intense leaf curling and intense leaf angle changes only at low leaf temperature (MIN). Another species had moderate leaf curling and no change in leaf angle (MAC). While R. ponticum had no curling and no changes in leaf angle. In general, this rank order of leaf movement intensity agreed with the rank order of cold hardiness. Although there was a difference in the intensity of leaf movements, there was little difference in the leaf temperature required to elicit leaf curling (0 to -2°C). In previous studies we found that leaf curling in natural populations occurred before leaf freezing (Nilsen, 1986; 1987). Because of the fairly uniform critical temperature for leaf curling, coupled with the difference in curling intensity among species, we decided to compare the leaf super-cooling point with leaf curling patterns. The super-cooling point is the leaf temperature required to initiate tissue freezing. This temperature is significantly lower than the freezing point because of the solutes in the leaf tissues. 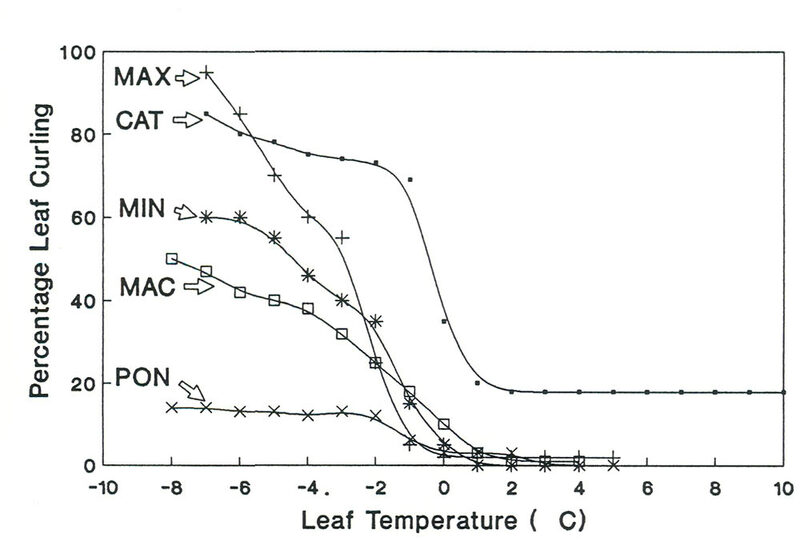 Leaf super-cooling points were determined with a thermal emission technique (Burke et al., 1976). The average super-cooling point for CAT, MAX, MIN, and MAC was between -8.2°C and -8.5°C. Only PON had a lower super-cooling point (-11.4°C). Thus the only species that had no leaf movements had a significantly lower supercooling point. Although R. ponticum had the lowest leaf super-cooling point, it was cold sensitive. Thus, the ability to lower the leaf super-cooling point was not related to differential curling intensity or winter hardiness. Several indices of water stress tolerance were measured on these five species. The water potential at which cells lose turgor (cell pressure) is called the turgor loss point (TLP). This is a good water stress tolerance indicator. The lower the TLP the better the species can tolerate water stress. A second water stress index is the water deficit at the turgor loss point (WD°). If the WD° is large, the plant can tolerate a large amount of water loss without loosing cell pressure. A third index is the symplastic water fraction (SWF). The SWF is a measure of the proportional quantity of leaf water inside the cells. If the SWF is high, more leaf water is in the cells and this will result in greater water stress tolerance. The fourth index is a measure of cell wall elasticity (E). The greater the E, the greater the possibility of water stress resistance. Table 1: Indices of water stress tolerance in Rhododendron . E = Cell wall elasticity. Small letters refer to significant differences at p = .05 (Mann-Whitney, Wilcoxon Signed Rank Test). *CAT = R. catawbiense ; MAX = R. maximum ; MIN = R. minus ; MAC = R. macrophyllum ; PON = R. ponticum . There was a general trend for three of these water stress indices. Those species with intense leaf curling and high winter cold tolerance (MAX, CAT, and MIN) all had high TLP, low WD° and low SWF (Table 1). Therefore the leaves on these plants lose turgor easily (at a small water deficit) because most water is not in the cells. Conversely, the two species that showed limited leaf movements and cold sensitivity (MAC, PON) had the opposite ranking of water stress indices. Therefore these cold sensitive species could remain turgid to lower water deficits and had more water in the cells. The relationship between winter hardiness measurements and water stress tolerance indices points out an interesting possibility. If winter hardiness is significantly impacted by leaf movements in Rhododendron species, and leaf movements require a succulent leaf with low water stress tolerance, then there may be a trade off between winter hardiness and water stress tolerance. This trade off would be counter to the general dogma in botanical literature which states that water stress tolerance often leads to cold stress tolerance. However, if the trade off is true for Rhododendron species then we need to understand the mechanisms behind the trade off and utilize that information in breeding programs. In summary, the experimental garden study indicated that there is a gradient of leaf movement intensity among Rhododendron species. Those species with intense leaf movements are more winter hardy than those without leaf movements. Furthermore, leaf supercooling point is not related to the intensity of leaf movement or winter hardiness. Finally, there may be a significant trade off between water stress tolerance and winter hardiness in Rhododendron species. The results from the experimental garden research stimulated several questions. First, does the relationship between cold hardiness and leaf movement hold across a larger number of species? Second, is this relationship strong enough to hold across the wide array of genetic mixing found in Rhododendron hybrids? Third, is there a leaf morphological or anatomical characteristic which correlates with the intensity of leaf curling among Rhododendron species? Our approach to these questions was to collect leaves from a large array of species (32) and hybrids (75). In the lab we determined the freezing points by the thermal emission technique. We also determined the leaf curling intensity at -10°C. We measured leaf morphological characteristics such as area and thickness. Finally we fixed leaf pieces in glutaraldehyde, sectioned them with a microtome, and measured leaf anatomical characteristics. We anticipated that these data would elucidate the range of curling intensity and leaf freezing points, and their relation to leaf morphology and anatomy. Additionally, we would be able to compare these results with published indices of hardiness. The 32 species and 75 hybrids utilized in the study were all from various regions of Virginia. Most of the species were from LEMAC Nursery in Hampton, Virginia and the research facility in Blacksburg, Virginia. Most of the hybrids were from Ted Scott's residence in Orange, Virginia and the VPI campus. These three growth sites are located in three physiographic regions of Virginia. The Blacksburg site is located in the southern Ridge and Valley, the Orange site is located in the Piedmont, and the Hampton site is located on the coastal plain. These growth sites differ in winter cold severity from the mildest (Hampton) to the harshest (Blacksburg). Therefore, the leaf collections represent plants acclimated to diverse winter conditions. Table 2: Hardiness ranking, leaf curling percentage, and average leaf area for 32 Rhododendron species grown in Virginia. ARS = American Rhododendron Society hardiness ranking. Question marks refer to cases where there is a disagreement among five sources for hardiness ranking. The 32 species, when considered as a whole, demonstrated a wide variation in leaf curling (Table 2), from 0 to 150% curled. The high curling percentages (100-150%) indicate leaves in which the leaf margins are overlapped when curled. The growing location for the species did not reflect in the curling intensities. We believe that these relative intensities represent a genetic difference among species rather than an environmentally induced difference. Most species had uniform curling intensities among leaves (low variation between leaves). However, in some instances variation was found among varieties of one species. For instance, several varieties of R. yakushimanum were evaluated ('Mist Maiden', 'Pink Parasol', 'Koichiro Wada' unnamed clone #3 'Ken Janeck') and there was a considerable range in curling percentage among genotypes (50-85%). Our analysis of leaf super-cooling points resulted in values from -6.8 to -11.0°C. Most species had leaf supercooling points between -7 and -9°C irrespective of their curling intensity. The two species with the lowest freezing points were R. yakushimanum (-10°C) and R. ponticum (-11.5°C) and these two species have contrasting curling intensities. Therefore, we found no indication that there was a relationship between leaf freezing point and leaf curling intensity or plant cold hardiness among these 32 species. (as defined by the American Rhododendron Society) in 32 species of Rhododendron . 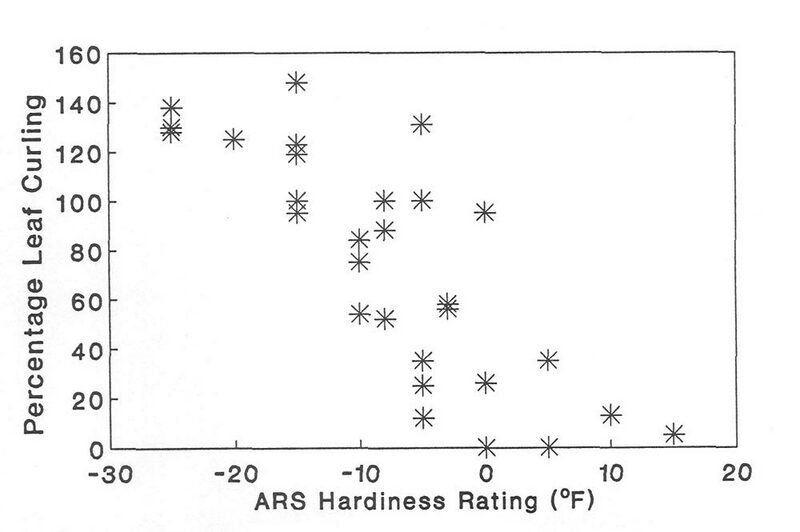 There was a significant relationship between leaf curling intensity and hardiness ranking (Figure 3). Hardiness ranking of species is based on that published by the American Rhododendron Society (ARS, 1967); however, over 10 sources were used to verify the consistency of hardiness ranking among sources (three nursery catalogs from the west and eastern United States; Sakai et al., 1986; Bailey, 1941; Davidian, 1982; Cox, 1979, 1985; Salley and Greer, 1986; Leach, 1961). We also compared the hardiness ranking with the native distributions of the species. When contradictions occurred in our hardiness ranking sources, or between the hardiness rank and the natural distribution, a question mark was placed on Table 2 or 3. As pointed out eloquently in a recent article (Spady, 1991), the hardiness rankings are confusing and must be evaluated carefully for each species. In our case, this is particularly true because we are studying leaves and hardiness ranking usually refers to flowers or buds. However, published data indicates that the flower bud is the most sensitive organ to cold stress in Rhododendron species (Kaku et al., 1981) and there is a close correlation between flower and leaf cold tolerance. Therefore, these hardiness values are underestimates of cold tolerance (lethal temperatures) in leaves. In summary, we found a wide diversity of leaf curling intensities among the 32 Rhododendron species. This variation can not be attributed to variable leaf freezing points. Additionally, morphological and anatomical measurements such as leaf area (Table 2) are not related to curling intensity. However, there is a positive relationship between leaf curling intensity and cold hardiness among these 32 species. Table 3: A comparison of percentage curling with hardiness ranking and leaf area in several Rhododendron hybrids. Editor's Note: * Unregistered but not in conflict with a registered name. Hybrid Rhododendron taxa also have a wide array of curling intensities (Table 3) even though they come from the same garden setting. The freezing points of the hybrids are very similar to those of species (data not presented) but there is no discernable relationship between leaf curling and hardiness ranking (Figure 4). However, if hybrids are classified into generalized hardiness categories the very hardy hybrids have strong curling (99%). Furthermore, the sensitive hybrids have a low leaf curling rate (23%). No relationship such as that just reported exists between leaf area and leaf curling (Table 3). Based on these results and those for species, the mixing of genotypes through hybridization has weakened the relationship between leaf curling and cold hardiness. This observation must be tempered by the possibility that the hardiness ranking of hybrids is not as sophisticated as that for species. The lack of sophistication comes from a lack of ecological and physiological information about the hybrids compared to that available for species. Figure 4. The relationship between leaf curling at -10C and winter hardiness in 75 Rhododendron hybrids. Both the common garden experiments and species survey indicated that there is a positive relationship between leaf curling intensity and cold stress tolerance in Rhododendron species. Our results indicate that the mixing of genotypes through hybridization weakens the relationship between leaf curling and plant hardiness in the hybrid population. There is no direct relationship between leaf freezing point and leaf curling or cold hardiness in Rhododendron species or hybrids. We have not yet been able to locate a morphological or anatomical characteristic positively related to leaf curling and cold hardiness. But, there may be a trade off between water stress tolerance and cold hardiness induced by leaf curling. All of the survey relationships found in this study are dependent upon the accuracy of hardiness rankings. Breeders, enthusiasts, and scientists studying Rhododendron species or hybrids need a cold hardiness index based upon a unifying cold tolerance concept. 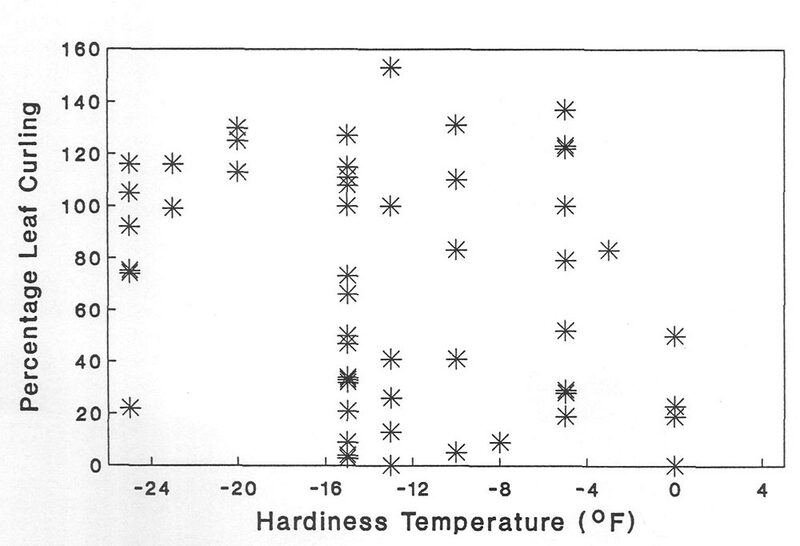 It is possible that the system suggested by Spady (1991) would make an excellent hardiness index. Alternatively, an index based on the temperature required to kill 50% of cells (LD50) in leaf tissue may be useable. Leaf curling may be either an indicator of cold tolerance, or a major mechanism of cold tolerance in Rhododendron species. The genetic information required for winter hardiness must involve many gene systems. The genes for leaf curling seem to be associated with those for cold hardiness in species. However, when species are hybridized the association between cold hardiness and leaf curling is lost. We must assume that the genes for leaf curling and others for winter hardiness are not genetically linked and can sort independently. More information is needed to verify the genetic basis of the linkage between hardiness and leaf curling. Our study has to be expanded into a larger variety of species, particularly those with severe cold sensitivity. A new hardiness ranking needs to be developed that is based on physiological tolerance to cold. In addition, more detailed studies of the relationship between cold stress and water stress tolerance is needed in a wider array of species. Furthermore, the specific physiological mechanism of leaf curling needs to be identified. All these data will allow us to understand cold tolerance in Rhododendron and promote breeding for stress tolerance characteristics. 1. 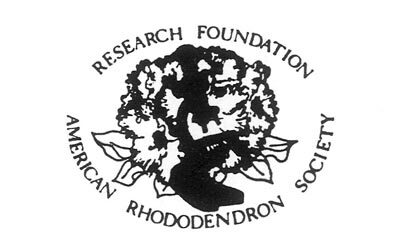 American Rhododendron Society. 1967. Rhododendron species ratings, pp. 117-125. in Rhododendron Information. 2. Bailey, L.H. 1941. The Standard Encyclopedia of Horticulture Vol. III. The Macmillan Company, New York, New York. 3039pp. 3. Bao, Y., and E.T. Nilsen. 1988. The ecophyliological significance of thermotropic leaf movements in Rhododendron maximum . Ecology 69: 1578-1587. 4. Burke, M.J., L.V. Gusta, K.A. Quamme, C.J.Weiser, and P.H. Li.1976. Freezing injury in plants. Annual Review of Plant Physiology 27: 507-528. 5. Cox, P.A. 1985. The Smaller Rhododendrons. Timber Press, Portland, Oregon. 271pp. 6. Cox, P.A. 1979. The Larger Rhododendrons. Timber Press, Portland, Oregon. 352pp. 7. Darwin, C. 1881. The Power of Movement in Plants. D. Appleton and Company, New York. 592pp. 8. Davidian, H.H. 1982. The Rhododendron Species. Volume I: The Lepidotes. Timber Press, Portland, Oregon. 431pp. 9. DeMairan. 1792. Observations Botanique. Histoirede Lacademie Royal des Sciences Paris, France. 10. Harshburger, J.W. 1899. Thermotropic movement of leaves of Rhododendron maximum . Proceedings of the National Academy of Sciences. 1899: 214-222. 11. Kaku, S., M. Iwaya, and K.B. Jeon. 1981. Supercooling ability, water content and hardiness of Rhododendron flower buds during cold acclimation and deacclimation. Plant Cell and Physiology 22: 1561-1569. 12. Leach, D. 1961. Rhododendrons of the World. Charles Scribner's Sons, New York. 544pp. 13. Lipscomb, M.V., and E.T. Nilsen. 1990a. Environmental and physiological factors influencing the natural distribution of evergreen and deciduous shrubs on north and south slopes of the southern Appalachian mountains. II. Water relations. American Journal of Botany 77: 517-526. 14. Lipscomb, M.V., and E.T. Nilsen. 1990b. Environmental and physiological factors influencing the natural distribution of evergreen and deciduous shrubs on north and south slopes of the southern Appalachian mountains. I. Irradiance. American Journal of Botany 77: 108-115. 15. Nilsen, E.T. 1986. Quantitative phenology and leaf survivorship of Rhododendron maximum L. in contrasting irradiance environments of the southern Appalachian mountains. American Journal of Botany 73: 822-831. 16. Nilsen, E.T. 1987. Influence of water relations and temperature on leaf movements of Rhododendron species. Plant Physiology 83: 607-612. 17. Nilsen, E.T. 1985. Seasonal and diurnal leaf movements of Rhododendron maximum L. in contrasting irradiance environments. Oecologia 65: 296-302. 18. Nilsen, E.T., D.A. Stetler, and C. Cassman. 1988. The influence of age and microclimate on the photochemistry of Rhododendron maximum L. leaves. II. Chloroplast structure and photosynthetic light response. American Journal of Botany 75: 1526-1534. 19. Nilsen, E.T. 1990. Why Do Rhododendron Leaves Curl? Arnoldia 50: 30-35. 20. Nilsen, E.T. 1991. The relationship between freezing tolerance and thermotropic leaf movements in five Rhododendron species. Oecologia 87: 63-71. 21. Nilsen, E.T., and Y. Bao. 1987. The influence of age and microclimate on the photochemistry of Rhododendron maximum L. leaves. I. Chlorophylls. Photosynthetica 21: 535-542. 22. Sakai, A., L. Fuchigami, and C.J. Weiser. 1986. Cold hardiness in the genus Rhododendron . Journal of the American Horticultural Society 111: 273-280. 23. Salley, H.E., and H.E. Greer. 1986. Rhododendron Hybrids, A Guide to Their Origins. Timber Press, Portland, Oregon. 391pp. 24. Spady, H. 1991. Defining hardiness. Journal American Rhododendron Society 45: 143-144. 25. Tyree, M.T., and H.T. Hammell. 1972. The measurement of the turgor pressure and water relations of plants by the pressure bomb technique. Journal of Experimental Botany 23: 265-283. E.T. Nilsen is an associate professor of botany and Athena Tolbert is an undergraduate biology major at the Virginia Polytechnic Institute and State University, Blacksburg, VA.